she is definitely all grown up and more mature now!! WOW ! Marvelous ! Great Job ! Honestly, I don't see the heavy-handed Photoshopping that a lot of people claim she was subjected to. Her jawline in these pictures look consistent, and it also doesn't look like she was given a digital noselift. She definitely had her nose done. i saw it as magnificent work.. great job.LIKE! go cha! @Anonymous 01/08/12|10:41AM: She probably have had a noselift done, but what I'm trying to say is the magazine certainly didn't give her one after the photoshoot. 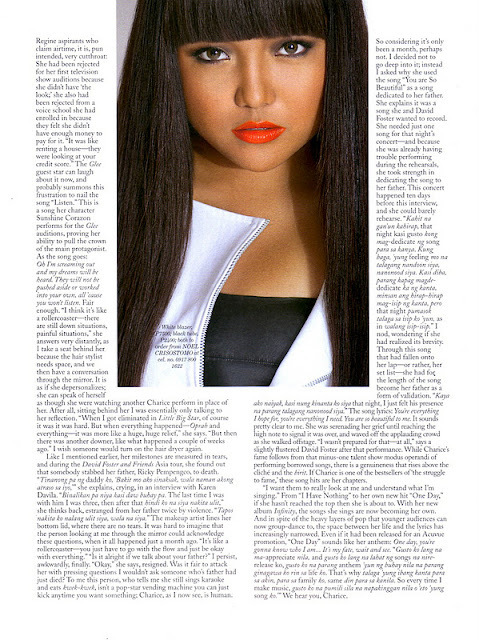 Charice's nose is all right. Walang problema. I find her pretty still. I dont think she had it done. If she did, the doctor did an awful job. Magreretoke na lang, hindi pa ganun kaganda. Think.